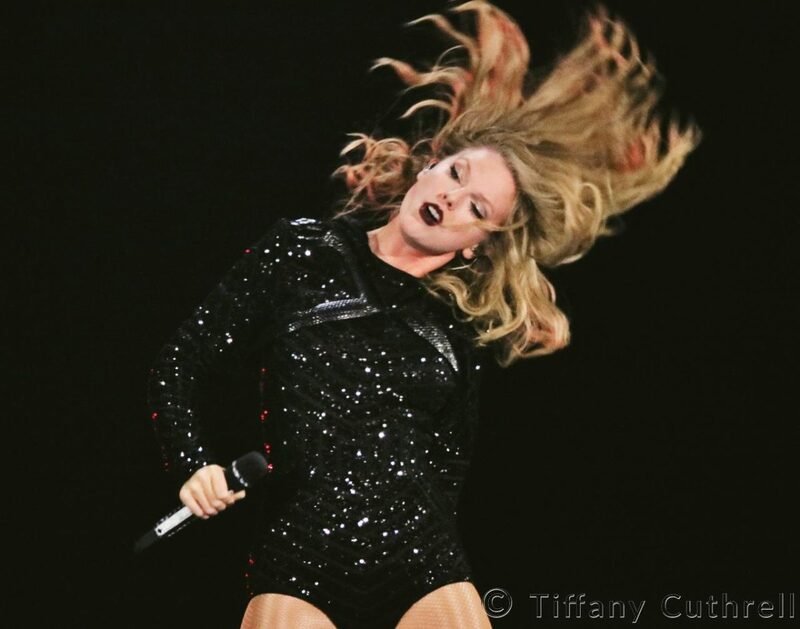 Taylor Swift is certainly a gal with a big reputation, but she let nothing but her talent shine at Ford Field in Detroit on Tuesday. Fans were greeted at the door with light up bracelets to hold high and add their own ray of shining light to the sea of Swifties in the crowd. Fans of all ages dotted the stadium. Several dressed up as characters from different Swift music videos and performances (I even saw a lady with plush kittens sewn to a robe…!) The costumes were no less than creative to honor their musical hero, covering the entire musical spectrum of Taylor’s incredible career. Taylor’s lucky number “13” was everywhere as well (including my own hand). 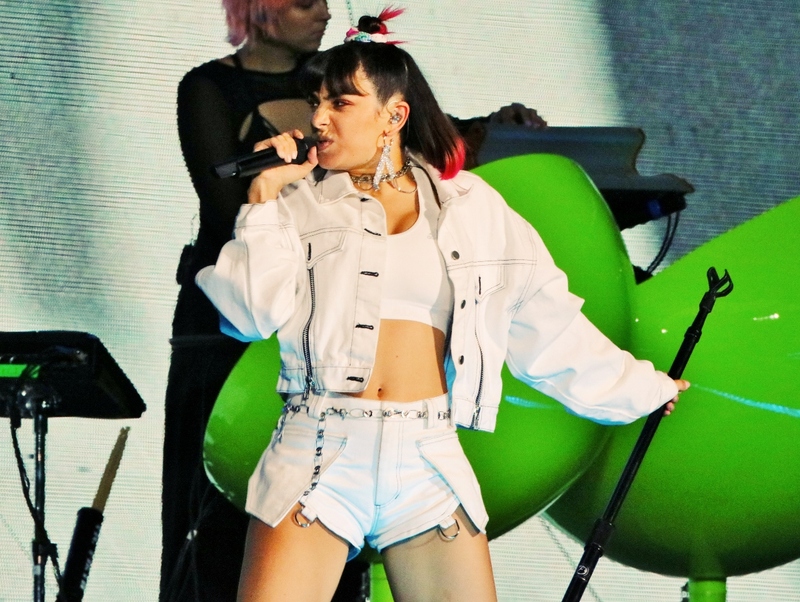 Joining Taylor on the gigantic tour are stellar artists Camilla Cabello and Charlie XCX, each arriving with exceptional musical reputations of their own. 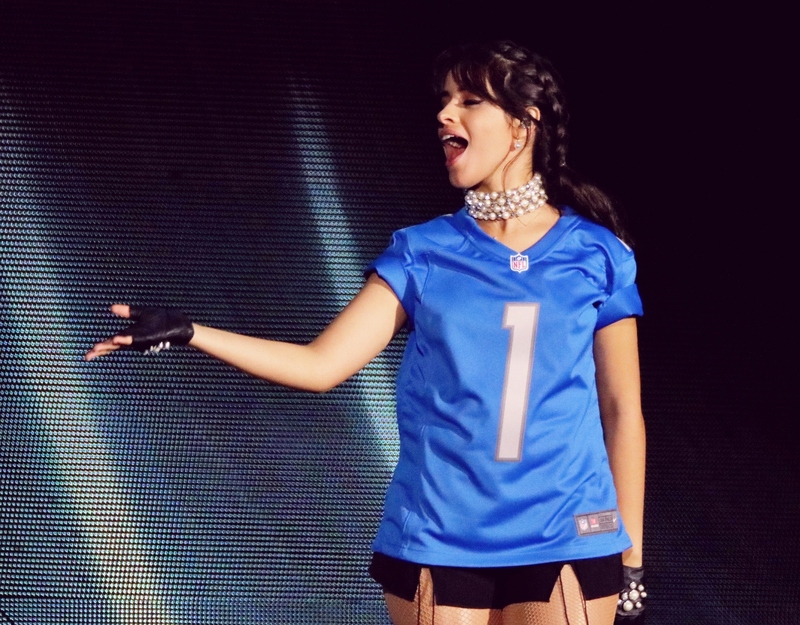 Next up was the fiery Camilla Cabello. 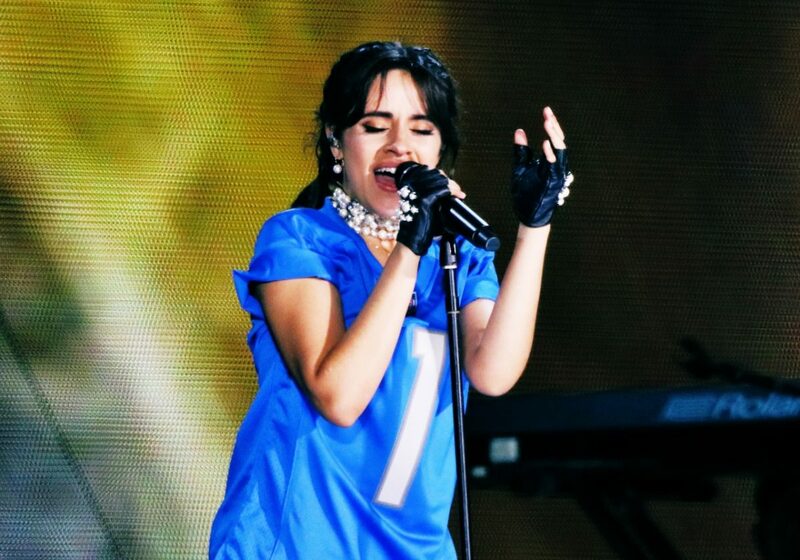 Having rose to the musical scene spotlight with Fifth Harmony, Cabello has branched out and into her own with tremendous songs like “Havanna” and “Never Be The Same”. Camilla waved, smiled, and blew kisses to several fans when her set began. 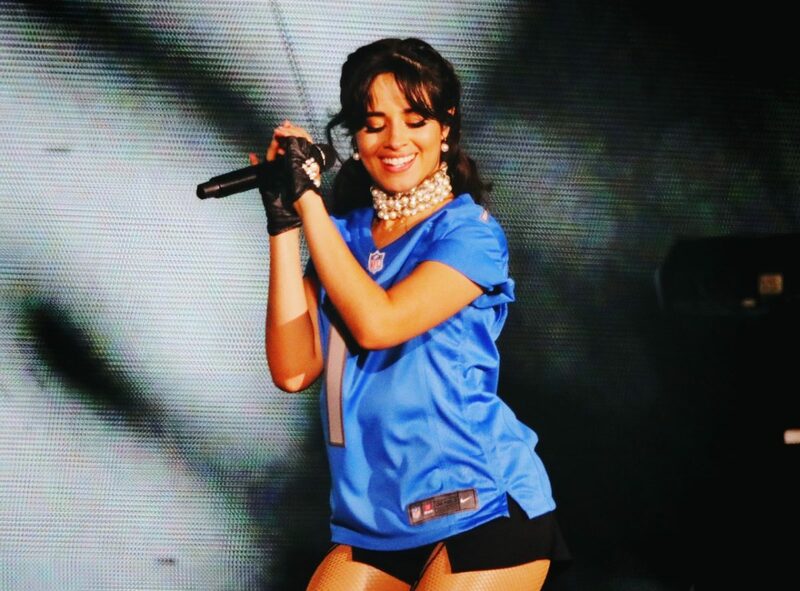 Dressed in a football jersey that sported her last name along the back, she addressed the crowd, “I’m from Miami, can we make it a little hotter in here?” With great dance moves, and a fun vibe, she encouraged the audience to sing along with her. 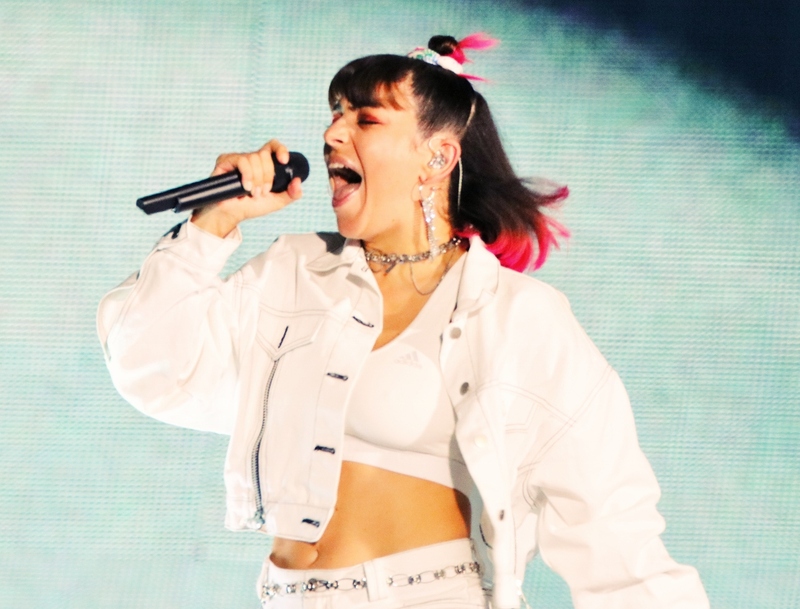 It was obvious several fans had also come early to see Charli and Camila as they sang and danced throughout each set. Ford Field’s energy was electric as the time for Taylor’s set drew near. Joan Jett’s “Bad Reputation” played across the stadium, starting Taylor’s night solidly before she even emerged. The lights dimmed, and a brief video showcasing certain career moments and whispers began. The massive screens parted ways for Taylor to appear, covered in a glittering hood. 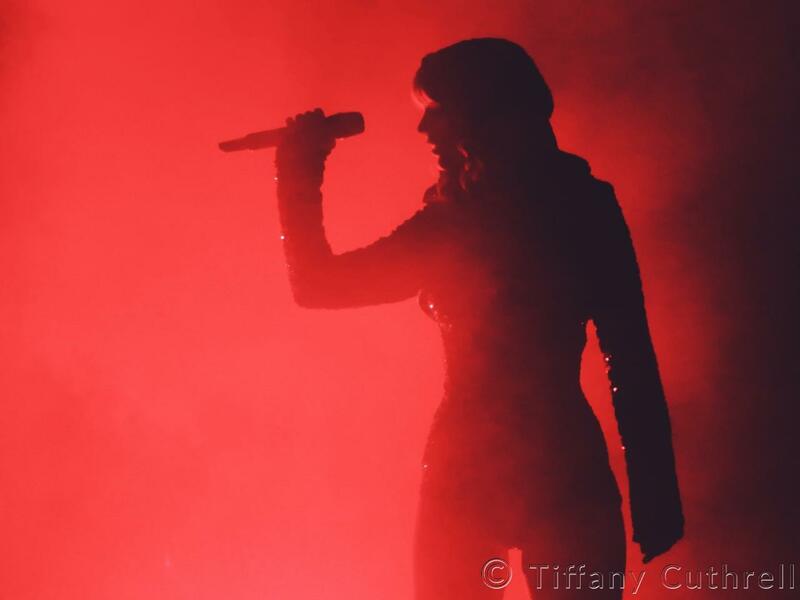 Smoke rose from the stage to the beat as “Ready For It” began. Ford Field was most assuredly ready for Taylor’s set to begin! Fans throughout the packed stadium sang along from the very first note. 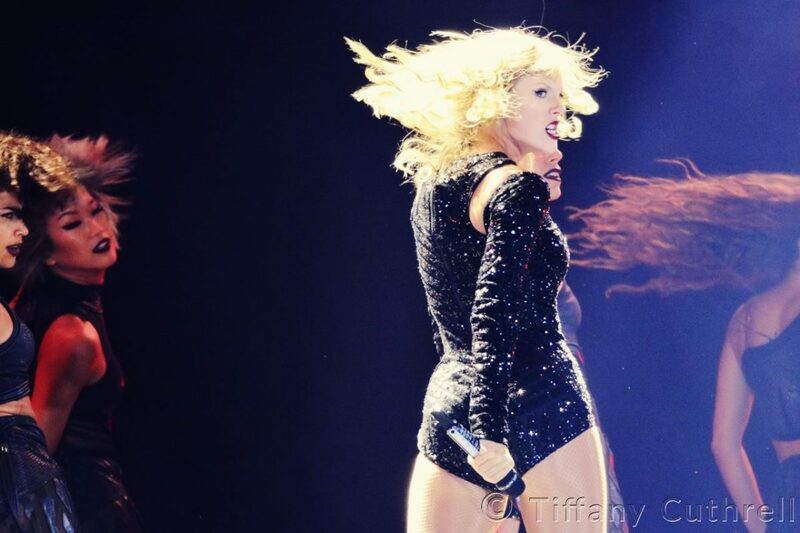 A dancer removed Taylor’s sparkling hood, and she moved into “I Did Something Bad”, another terrific track from “reputation”. Her strong attitude and ample expressions emphasized the song’s feel. Toward the end of the song, Taylor and her backup singer chorus echoed, “Light me up, light me up” as dancers raised her high above the stage. She continued, “It’s not like you just know the words to the songs, you guys are screaming the words to the songs and I really appreciate you doing that. It’s just a beautiful thing that you would be that passionate. You know, it’s actually more than beautiful. Do you know the word for something that’s more than beautiful? What’s the word for that, Detroit?” Immediately, “Gorgeous” began. Before the final verse, she took a minute to introduce the gorgeous gals on her tour. Next during “Style”, she encouraged the crowd to make some noise for her band, and transitioned into “Love Story”. “Detroit, let me see you jump!”, she exclaimed. A video montage soon began in which Taylor climbed onto a tall throne of snakes. With a wink, “Look What You Made Me Do” started. Taylor was set on a tilted stage of her own. A giant snake rose tall above the stage. The set continued into two more tracks from “reputation”, “End Game” and “King Of My Heart”. Upon concluding, Taylor began speaking on one of the most powerful local heroes… Aretha Franklin. In a touching moment, Taylor reflected that Aretha did so much for music, for women’s rights, and for civil rights. Everything went dark for the moment of reflection. With a beautiful, sparkling rainbow dress, she began into “Delicate”. Swift entered a golden enclosure, perfect for the new album’s golden theme. 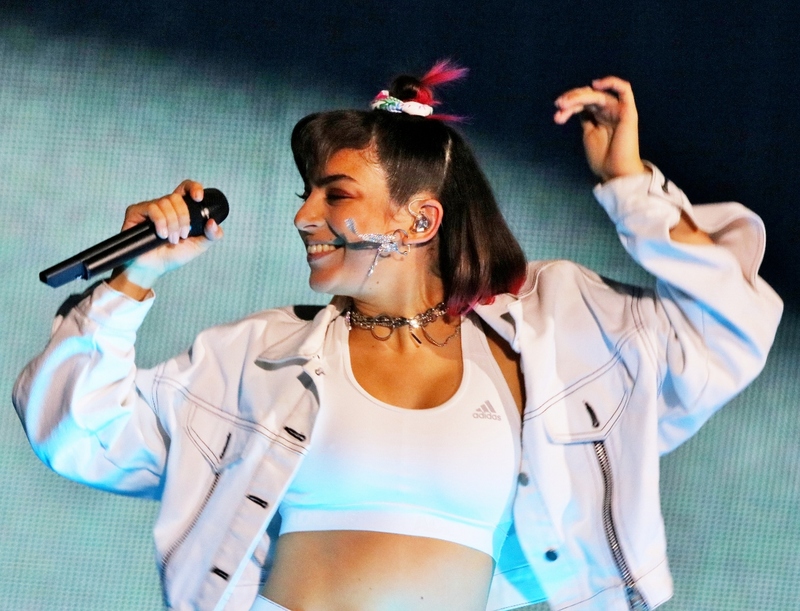 She soared above the audience, serenading the crowd, as she made her way to one of the venue’s two smaller stages on the other side of the stadium. The crowd was ready to dance as soon as “Shake It Off” began. After the song’s first chorus, she welcomed the incredible openers back to the stage. 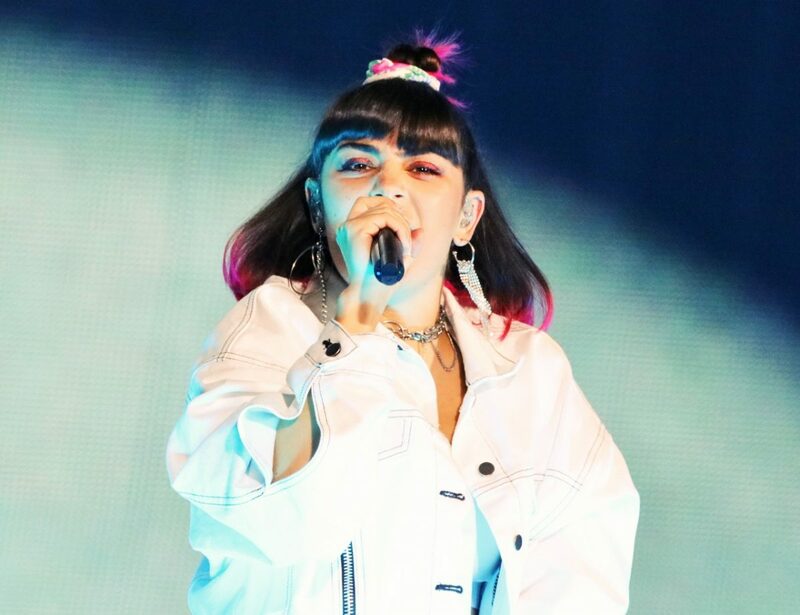 Charlie XCX and Camila Cabello joined the shining superstar to dance and shake any blues away. Rainbow confetti popped, and showered the stadium with colorful fun, adding a perfect celebratory touch. Dressed in a glimmering green reputation jacket, Taylor continued her open dialogue with the audience. “You may notice something about your outfit… you may notice a light up bracelet on your wrist”. 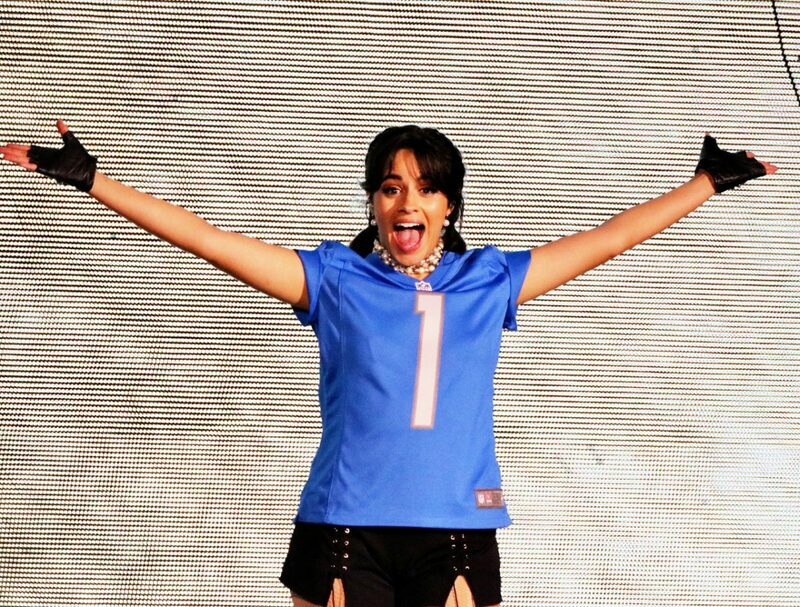 She told the crowd that this is her first full on stadium tour, and though they are really massive, vast places to play, she wanted the bracelets to illuminate each fan. “I really wanted to be able to see every single one of you in this place. The last section, the last row, I can see you, and that makes me really happy. I can see when you’re jumping around. I can see when you’ve got your hands in the air. I can see you dancing”. She started into “Dancing With Our Hands Tied” with just her acoustic guitar. Her skill as a musician was on full display. The audience cheered and applauded, answering a resounding “Yes!” without having to speak now a single word. “I’ve been doing different songs than I usually do, songs I haven’t played in a really long time, or maybe songs I’ve never even played acoustic. I’m pretty sure I’ve never played this song acoustic live.” She smiled and noted, “If I’m wrong about that, I’m sure the internet will remind me later”. She began into a stunning version of “Jump Then Fall”. When the song wrapped, Taylor made her way along a barricade that connected both smaller stages. She grabbed fan’s hands while beaming a glowing smile to everyone along the path. Taylor absolutely radiated confidence and endless love for each fan in attendance the whole night through. Despite the show’s larger than life size, Taylor still managed to give the evening a personal feel, making every single fan feel so welcome and so special. 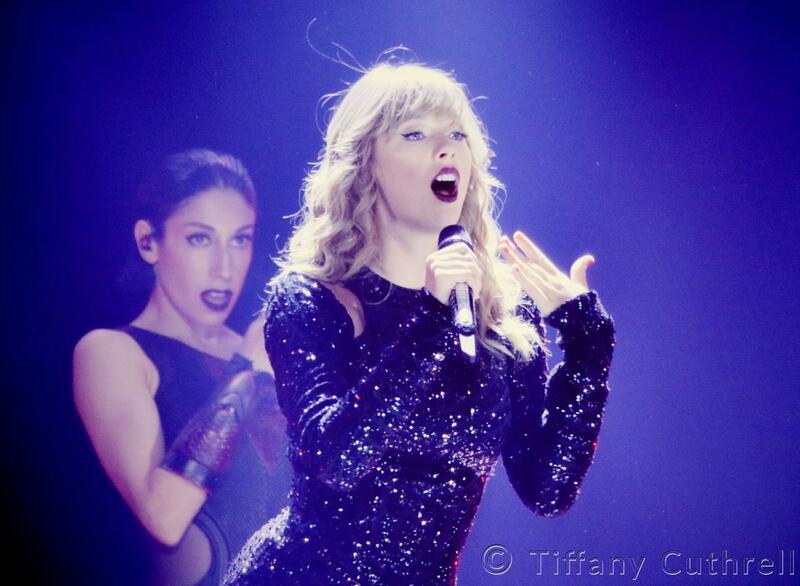 Once she made her way to the second smaller stage, she started into “Blank Space”. It was truly spectacular to see an artist taking the time to play to each part of the stage, no matter how small. She slipped on an airy black dress to emote the honest and beautifully written “Dress” from her latest album. Once arriving at the song’s last line, “Only bought this dress so you could take it off”, she slipped off the dress as the lights dimmed. The attention to detail she paid to each song was second to none. During “Bad Blood”, Taylor made her way back to the main stage via a soaring skeleton cage transport. She also included a mix of “Should’ve Said No”. Swift then started into the vocal masterpiece, “Don’t Blame Me”. Screens that showcased the stage were shaped like arches, emphasizing the song’s religious feel. Backing vocalists joined in, adding as much power to the live show as the song has on “reputation”. She then reflected on how unreal it is when people remind her of the passage of time. “When somebody comes up to me and says, ‘I’ve been listening to your music since I was 8’, and I’m looking at an adult saying that to me… No matter how many times somebody says that, it’s still really surreal. When somebody tells me that I’ve been more than a year long phase in their life, I really appreciate that. I want to sing a song that I wrote a while ago, but for me, it’s always going to be about you”. With just her lovely voice and piano, she started into “Long Live” from 2010’s album, “Speak Now”. Concert-goers waved their wristlets in the air, and many embraced. With an adjoining “confetti falls to the ground”, she started into “New Years Day”. After, the stadium was silent as another video began. Taylor was standing in the desert, different moments flashing by, as she read a sharp, poignant, honest, and vulnerable poem. “Getaway Car” commenced. A backdrop continued landscape expanses, emoting words from the song spotted in neon. Next up she sang, “Call It What You Want”. A lovely fountain was set up center stage, as white confetti shot up over the stadium. Adding a personal touch at the end of the song, Swift flashed a peace sign, or two right in line with, “Call it what you want to”. In a purple sequined dress, Taylor began into a medley of “We Are Never Ever Getting Back Together” and “This Is Why We Can’t Have Nice Things”. All of the performers closed out the night with an absolutely epic party! Bracelets sparkled bright in the stadium, fireworks shot up from the top of the stage, and even the water in the fountain danced along. Clearly ever-grateful for each person with her onstage, Taylor encouraged the crowd, “Please make some noise for the dancers. Make some noise for the singers!” She formed a line with everyone and they all bowed together. After asking the audience to “Give it up for the band”, she ran to both sides of the stage, bowing again. Once Taylor had disappeared from view and the music stopped, “And in the death of her reputation, she felt truly alive” graced the screens. The old Taylor might be dead and unable to come to the phone, but the snake-clad goddess who has taken her place sure puts on one exceptional show. Taylor has continued to evolve right before our very eyes stylistically and musically as an artist, as a person, and as a beautifully powerful force to be reckoned with. With any amount of negativity thrown her way, or any jab at her reputation, Taylor has remained an entertainer who truly epitomizes class, talent, generosity, and above all, magnificent songwriting. The Ford Field stop of her tour left no doubt as to why she’s one of the world’s most successful artists, and one unafraid to take risks. The reputation Stadium Tour will continue with nine more shows in the United States, before heading overseas through November. 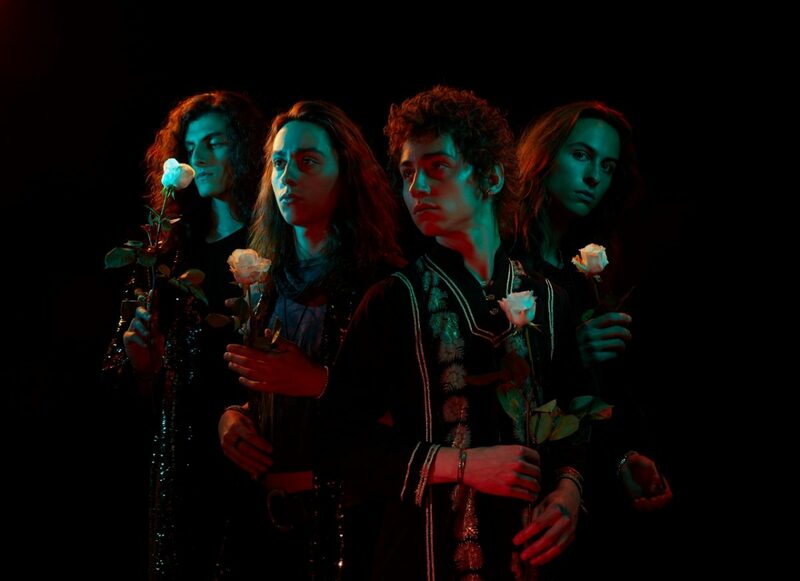 Michigan native rockers, Greta Van Fleet released an incredible new single, with the full support of the mitten state behind them. The single “When The Curtain Falls” dropped on Tuesday July 17th at midnight via the band’s social media outlets. With catchy riffs and powerful vocals, the Frankenmuth fellas present a track that does not disappoint, and sticks true to their sound. The band has been making waves with their undeniable throwback presence, selling out shows left and right. The single is surely a sample of great things to come, as the band is set to release their debut full-length album at some point this summer. Greta Van Fleet will be performing on “The Tonight Show With Jimmy Fallon” on Thursday July 26th. Be sure to check out their performance, and stay tuned for more great music coming from a band that’s certainly doing rock ‘n roll right.